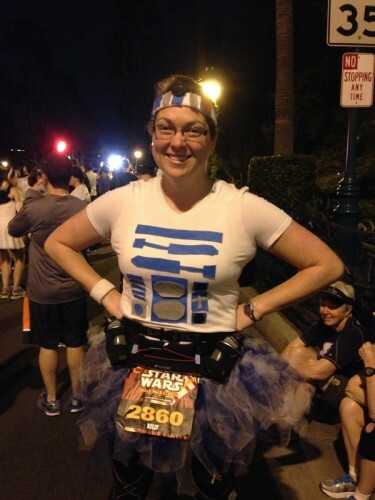 Home » Disney Running » runDisney Races » Star Wars Half Marathon Weekend	» Run Your Buns Off at the Star Wars Half Marathon! 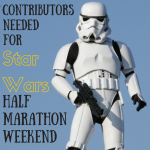 What do Mickey Mouse, a Storm Trooper, and missing toenails have in common? 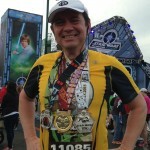 They represent my experience at Disney’s Star Wars Half Marathon! A little about me: I used to hate running. A recently as two years ago I said, “We are alotted a finite amount of run in our lives and I’m saving up all my run in case I’m ever chased by a dog.” But then my friend, Tracy, bewitched me and convinced me to run a 5K – she even said she’d come down and run it with me. During that first, momentus run, I experienced the thrill of completing something I didn’t think was possible, the strain of muscles that I didn’t even know I had, and the magic that exists at the finish line. I caught the running bug and haven’t looked back. 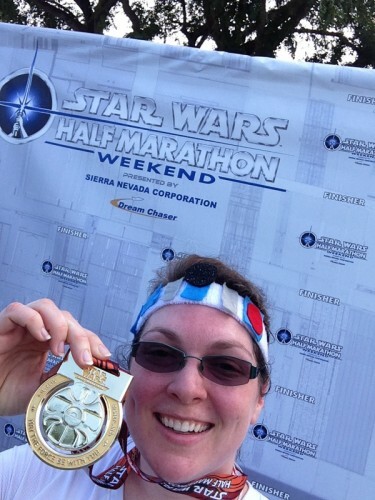 The Star Wars Half Marathon would be my third half marathon so I had high hopes for it. I had a time goal, expectations, and I’d trained thoroughly. Also, I was helping my friend, Nathan, running his very first half marathon. Nathan hadn’t trained well and even bought his running gear at the expo where we picked up our packets! 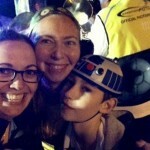 The day before the race we discussed our anxieties about the race the next day. We had different expectations, but were both competing against ourselves. I wanted not only to perform well for myself, but also to be a source of encouragment for my friend. I’ve gone from non-runner, to running-mentor in two years which never ceases to amaze me. 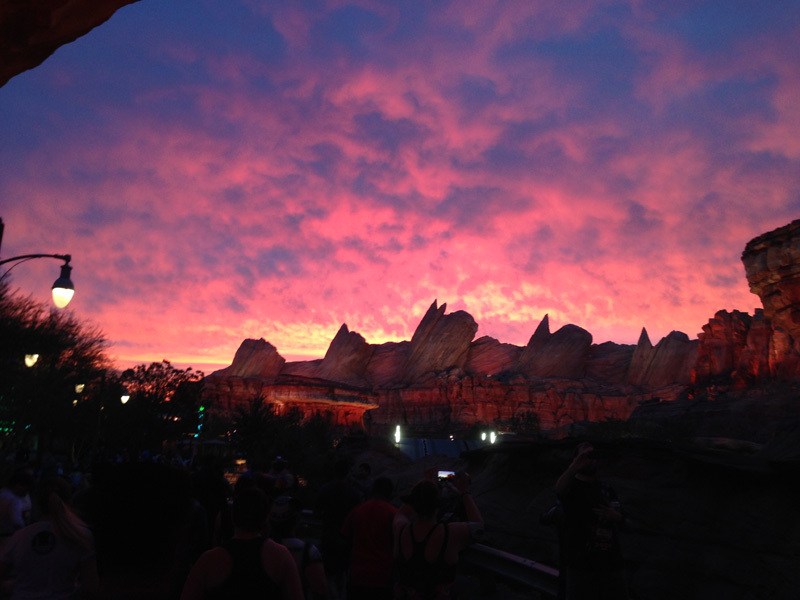 Starting my day at 4 am in Downtown Disney and winding through both Disneyland and California Adventure was magical. The first four miles of the course were on Disney property, surrounded by characters and carousels. 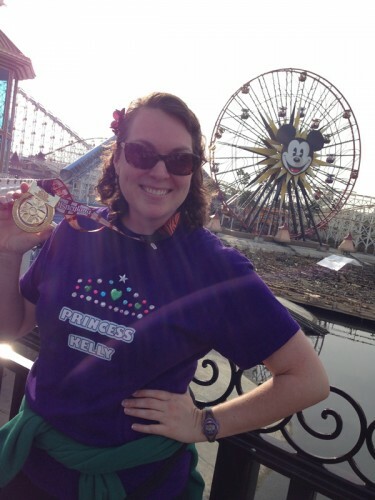 It’s easy to run when you’re distracted by the excitement of the parks. My absolute favorite moment was rounding the corner in Cars Land and seeing the sunrise over the red rocks. I felt like Forrest Gump seeing the desert surnise. The woman running next to me was convinced that it was a painted backdrop and not the sky’s natural beauty. I had to stop and take a picture! Keeping pace and excitement became a little more difficult the latter nine miles when we wound through the streets of Anaheim. Even thought it wasn’t as magical as in the parks, we still had plenty of ambiance. We ran past half a dozen local high school bands, all playing the Imperial March for encouragement as well as a plethora of Star Wars fans. 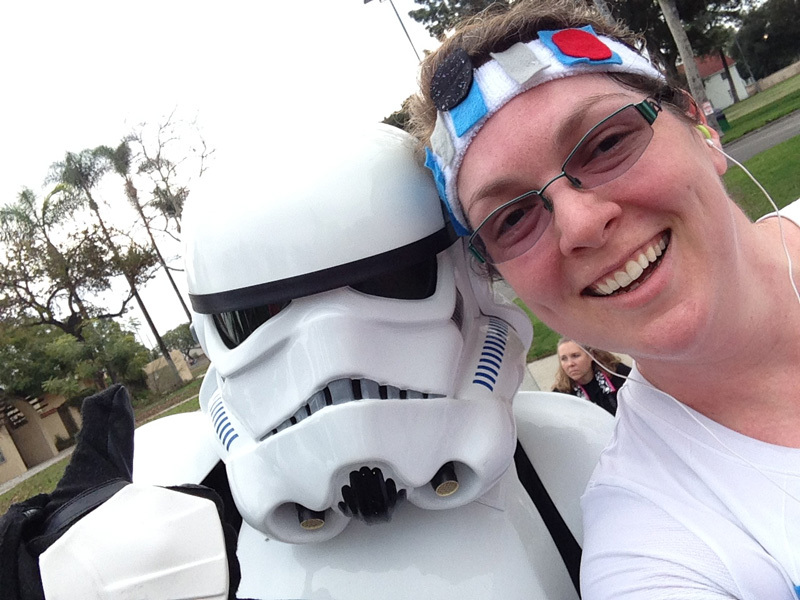 There were a dozen Storm Troopers and several Chewbaccas holding signs and cheering us along. I am pretty sure these were just fans to showed up and wanted to be a part of the innagural race. Some gave out refreshments; some held up signs filled with Star Wars puns; all made me smile. At mile twelve I knew I had a chance to set a personal record. Even though I was spent, and chilled, I knew I couldn’t forgive myself if I slacked pace now. So I pushed, counting down the minutes and the miles until I saw the magical finish line. 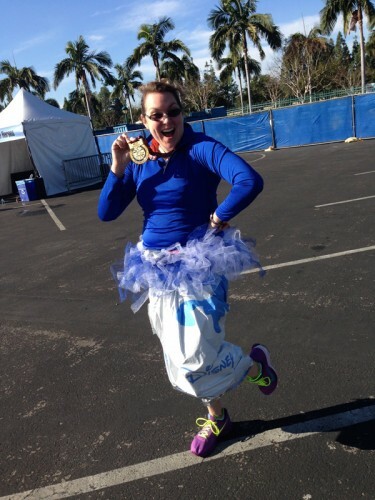 I’ve tried to explain the magic of the finish line to non-runners and they just don’t get it. My eyes tear up at every race when I hit that last point one miles. I am amazed at the hours and months (and money!) that went into this moment and I want to savor it. I have never purchased a race photo since I am either crying unbecomingly in them or looking down to stop my watch and see my time. Even though I’ve never gotten flattering photo evidence of my finish, I remember each one and look forward to the next magical finish line that I get to cross. That is the short story of my running experience, but I don’t run just for times or medals or dry fit shirts. I run to learn about my limits, my stamina, and myself. Running has been an incredibly powerful object lesson in life. Believing in myself, striving for more, pushing through when times are hard, and running with the encouragment of others — I’ve learned a lot through my running days. Those lessons are the things that make me keep running. So what did this race teach me? Something goes wrong in every race. Whether its running out of Gu, or toileting urgency, or untied shoelaces, or poor weather, or dead iPod batteries – I’ve experience (and gotten through) them all. I’ve learned that I’m not as dependant upon outside sources of motivation as I thought. I have to believe in my training and focus on my drive to succeed instead of the imperfection of my surroundings. I can choose to focus on the problems in life or on the progress. I want to be thankful for the mile just completed and look forward to the next one in running and in life. Stay the Course! I do math constantly while running. I calculate my pace and time each mile. I trained to run intervals because my knees can’t handle constant running. As I was doing math around the 5K mark, I realized I’d somehow lost 4 minutes and was behind my planned pace. I had moments where I was frustrated with myself and I wanted to push through, skipping my walking interval and just run. But I knew that I hadn’t trained for that. If I tried that plan, I’d run the risk that I’d exhaust myself and end up slower overall. So I kept to my plan and my training and stayed the course to run with endurance the race set out before me. And it worked! I set a personal record on this race! The same is true in life! Sometimes things don’t go according to plan and I lose four minutes in my world. Don’t panic. Recalculate. And stay the course. It will be okay! It is important to celebrate! The hardest race I ever competed in felt lonely the entire time because I didn’t have the opportunity to celebrate. 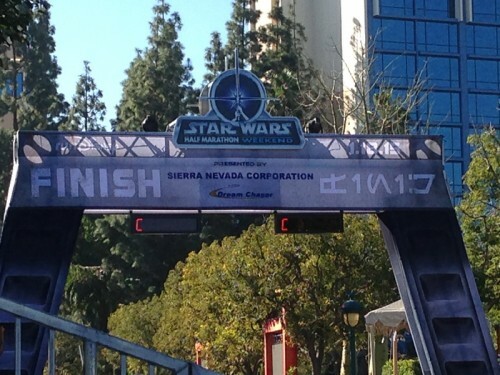 The Star Wars Half was a completely different experience because it was swaddled in celebrations. Even when I crossed the finish line at this race and fist pumped for my own PR, I knew I wasn’t done. I was going to wait for Nathan and cheer him through the finish line. I tear up every time I watch people cross the finish line. 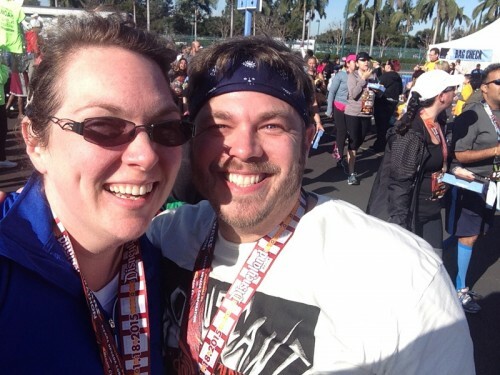 I get especially choked up watching people who, if I just glanced at them, would not think they could complete a half marathon, but they prove me wrong every time – and I love it! I love to high-five and clap for these people who are only competing with themselves and disproving their, “I can’t do it” lies! I saw this same wide-eyed, emotional, “I can’t believe I just did that!” look in Nathan’s eyes. He wasn’t ready. Hadn’t trained much at all. But he kept moving forward for 13.1 miles. He learned first hand the magic that exists at finish lines. He found me, tears in his eyes, and we hugged and hobbled to celebrate our achievements at the Happiest Place on Earth, Disneyland! Celebrating is important in life. I can’t be so focused on the next race or the next achievement that I forget to stop and be thankful for what just happened. I need to celebrate my life and share the joy with others. Running has taught me all these lessons and more and when I glance at my rack of race medals glinting in my room I am reminded of each race, each experience, and each lesson. I am thankful for the ability to run and look forward to more races and more lessons in the coming days. I loved my weekend preparing for, running, and celebrating the Star Wars Half Marathon. But I couldn’t have done this alone! 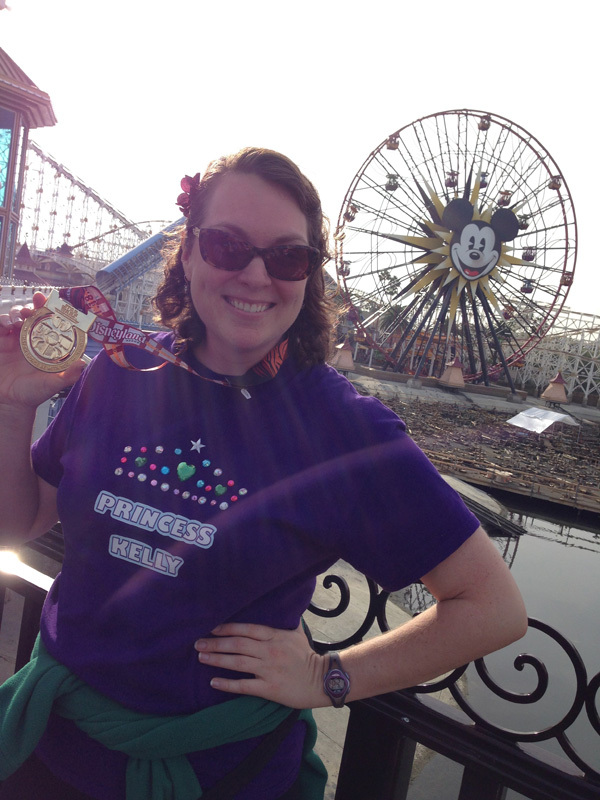 I’d like to thank my friend, Tracy, for making me my celebratory “Princess Kelly” t-shirt and for getting me running in the first place. My family, friends and coworkers for cheering me on from afar and creepily tracking my progress by my bib number. And I’d like to thank the academy. It’s an honor just to be nominated. Stay RAD! Follow Kelly on Facebook, Twitter, Instagram and Pinterest! 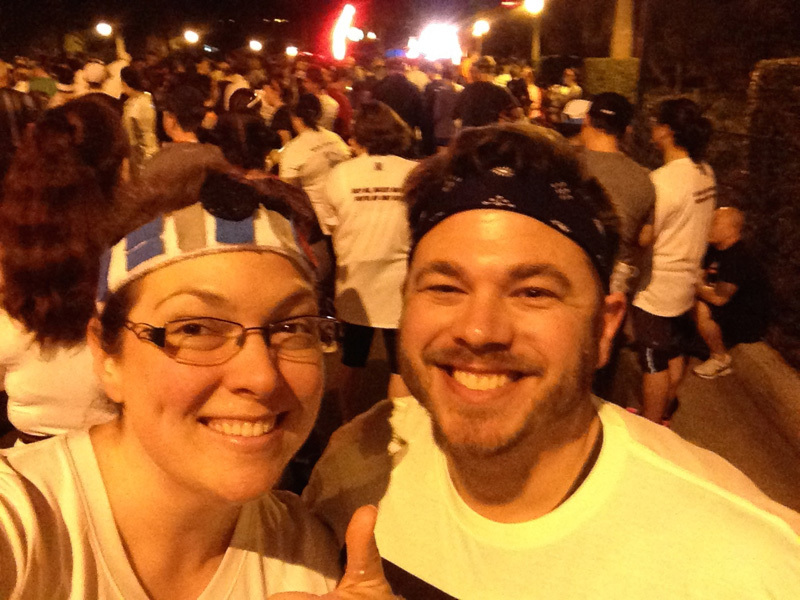 2 Responses to Run Your Buns Off at the Star Wars Half Marathon!